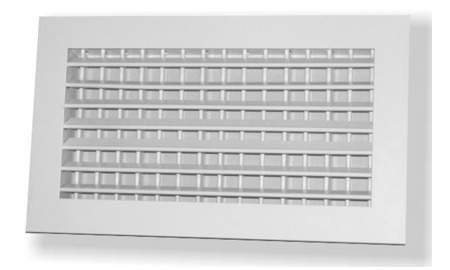 Double deflection grille for wall or ceiling mounting, with individually adjustable blades for directional air jet control. Suitable for air supply. Fixing: standard with visible countersunk screw; concealed fixing available as an option. Finish: standard finish is white RAL9010; another RAL color or aluminium finish available as option. Dimensions: sizes ranging from 100mm x 100mm to a maximum of 2000mm x 2000mm. Options: - flow rate control damper - counterframe for concealed fixing - plenum box, must be ordered separately For any details please request the technical data sheet!